The attention of the world has recently been focused on the humanitarian tragedy of the violent conflict being pursued by various armed groups in the eastern region of the Democratic Republic of the Congo (DRC), specifically since the rapid advance during November 2012 of the rebel group known as the March 23 Movement (M23) that operates mainly in the Congolese province of North Kivu. M23 managed to capture the regional Congolese capital of Goma on 20 November 2012 after the withdrawal of about 2 000 soldiers from the Congolese National Army (FARDC) and 700 Congolese policemen. Goma fell to the rebel group despite the presence of nearly 6 000 armed peacekeepers in the North Kivu province, over 1 500 in the Goma area alone, under the United Nations Organisation Stabilisation Mission in the DRC (MONUSCO). 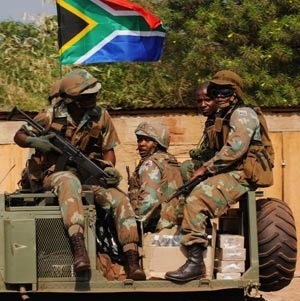 This included a battalion of 850 South African National Defence Force (SANDF) soldiers, all deployed under a United Nations (UN) Security Council mandate written in terms of Chapter Seven of the UN Charter, which allows the use of ‘coercive measures’ (force) in support of mission objectives. With nearly 2 000 000 internally displaced people (IDPs) in the Eastern DRC and the UN reporting that it had lost access to 30 of 31 IDP camps, international intervention was clearly needed. On 24 November 2012, leaders from the International Conference on the Great Lakes Region (ICGLR) member states met in Kampala, Uganda and gave M23 a two-day ultimatum to leave Goma – which was ignored. Following intense diplomatic pressure and renewed offensive operations by FARDC against the rebels, M23 declared its intention to withdraw from Goma by 1 December 2012. However, on the eve of the withdrawal, the rebel group allegedly carried out widespread looting. On 3 December 2012, two days after M23 had withdrawn, FARDC forces and other government officials re-entered Goma. After the failure of the UN to intervene, leaders of 11 African countries decided on a new way forward and on 24 February 2013, signed a Peace, Security and Cooperation Framework for the DRC – an agreement designed to bring peace to Eastern DRC. With commitment from the Southern African Development Community (SADC) to become more involved, the agreement included the deployment of a brigade strength Neutral Intervention Force (NIF) of approximately 3 500 soldiers, authorised to conduct aggressive peacekeeping operations to protect civilians under imminent threat and to neutralise armed groups involved in destabilising the region (specifically M23). In line with aspirations of the New Partnership for Africa’s Development (NEPAD), an African solution for an African problem, it seemed, was finally in sight – or was it? The UN Department of Peacekeeping Operations (DPKO) was badly shaken by the ease with which Goma had fallen to M23. The credibility of MONUSCO and indeed its perceived will to implement one of its prime tasks – the protection of civilians under imminent threat, was seriously being questioned. To make matters worse, the NIF was being touted as a force that would do what MONUSCO, with 17 000 troops, was unable to do. In reality, however, the NIF was a concept that had little chance of success due to prohibitive cost, estimated at USD $100 million for its first year of operation, with the DRC offering to pay USD $10 million. The complexity of operating without full UN support was also a problem, despite South Africa’s commitment to support the mission with helicopters and transport aircraft, specialised support staff and a forward operational support base to be established at Entebbe, Uganda. The SADC planning element scrambled to generate the NIF’s operational components from the SADC Standby Force pledges from member states, while it was left to each Troop Contributing Country to work out how they were going to self-fund this deployment. This willingness of the African countries concerned to go it alone further shook the UN and galvanised it into action, with the DPKO proposing the deployment of a UN intervention brigade, utilising SADC troop components that would have deployed under the NIF. It must have been with a collective sigh of relief that the 11 African heads of state, supported by SADC and the African Union (AU), agreed to this change of direction. South Africa, Tanzania and Malawi would be the primary Troop Contributing Countries for this Intervention Brigade of 3 069 soldiers, authorised in terms of UN Security Council resolution 2098 of 1 April 2013, with the responsibility for ‘neutralizing armed groups …. contributing to reducing the threat posed by armed groups to state authority and civilian security in Eastern DRC and to make space for stabilization activities’. A stretched SANDF will not contribute a second Battalion of peacekeepers, but will merely re-role its existing battalion of troops deployed in and around Goma, to be part of the MONUSCO Intervention Brigade. Malawi will contribute its battalion of peacekeepers previously deployed in Côte d’Ivoire under the UN mission there, redeploying them to the Eastern DRC, together with a platoon of special forces. Tanzania will provide a battalion of troops and the Brigade Commander. The Intervention Brigade will have extra teeth in the form of artillery support and special forces, who together with unarmed drones (remotely piloted aircraft) with special day and night observation equipment, will provide situational awareness – the intelligence and information picture which enables the conduct of high impact, intelligence driven and targeted operations to deal with M23 and the other illegal armed groups in the region, which number over 33 at this stage. With the most aggressive mandate ever given to a peacekeeping mission, much hype has been generated about the expected success and influence of the Intervention Brigade. After more than 10 years of peacekeeping deployment experience in Eastern DRC, the SANDF contingent will form a core component of the Intervention Brigade and much will be expected of it. However, is it realistic to expect that the decisive operational success that would be required can dramatically alter the security environment and deliver the rule of law and humanitarian security that is so desperately needed? The realities of conducting operations in this remote and complex environment have been underestimated in the rush to put solutions on the table. The ability of the Intervention Brigade to effectively conduct ‘war fighting’ operations in an integrated manner, are questionable. With different operational doctrines, a variety of tactical deployment techniques and military equipment that is often not interoperable, the battalions can fight as individual units, but questions arise about whether they can or must fight as a cohesive brigade. Specific challenges include the tactics and doctrine of planning and delivering fire support from direct fire weapons such as the cannons of the armoured personnel carriers, to the indirect fire of the mortar and artillery capabilities. This is especially relevant when engaging in ‘close fire support’ where safety distances, targeting procedures and fire coordination become an issue. Will South Africa’s military forces be a playmaker for MONUSCO and provide some desperately needed credibility in the face of both real and perceived failures to protect civilians? Consider that in the past, mass rapes and atrocities occurred only 2 km from UN bases without the peacekeepers intervening or even being aware of the incidents. Will this deployment bog down into a cycle of frustrating operations, a protracted counter-insurgency type scenario characterised by atrocities in which entire villages are wiped out by rebel forces in order to divert the attention of the brigade into a defensive mind-set focused on the difficult task of protecting civilians rather than neutralising illegal armed groups? Will this deployment be written up in history as another costly intervention in terms of peacekeepers’ lives lost in an operation that does not address the root causes of this intractable and complex humanitarian emergency? Is this again a peacekeeping band-aid that will struggle to meet the high expectations that do not consider the difficult realities of the situation? Only time will tell.